I recently found myself with an abundance of lemons and couldn’t quite decide how best to use them. So I took to Instagram and asked what everyone thought I should make. I got lots of really good and inspiring answers, but there seemed to be a good bit of excitement surrounding the prospect of a Lemon Poppy Seed Cake. 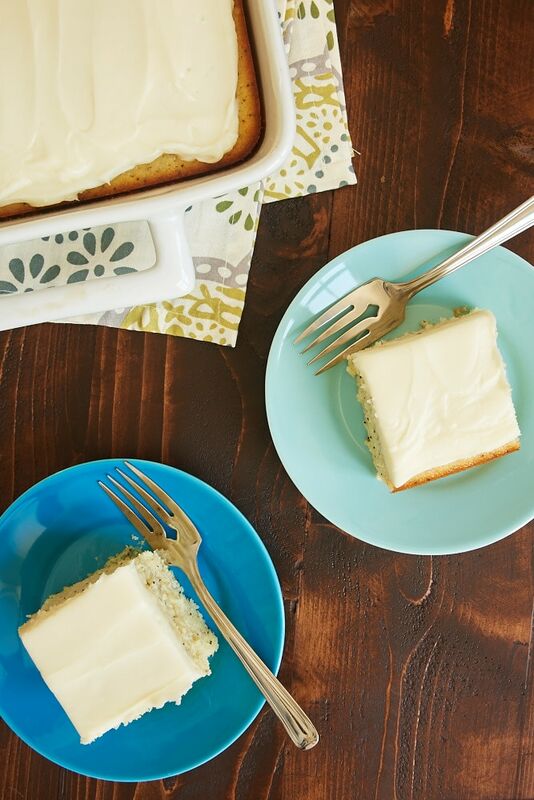 It’s a bit of a mystery how I’d never shared a recipe for Lemon Poppy Seed Cake with you after all these years. This seemed like the obvious time to remedy that, so I got to work thinking about cake recipes, possible toppings, and just how much lemon is enough lemon. Most interpretations of this kind of cake seem to be either dense loaves or Bundts. I wanted to do something a bit different, though. 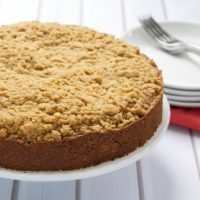 I opted for a lighter, softer cake that has the most amazing crumb. 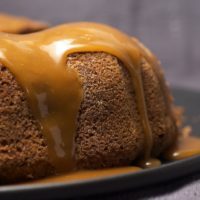 I could really just enjoy little bites of this tasty, moist cake all on its own! As for topping options, I considered a simple lemon glaze, but I feared it would get a bit lost with all the lemon in the cake. So I talked myself into a cream cheese frosting. Not that there was much inner turmoil, mind you. I’ll take pretty much any excuse to incorporate cream cheese frosting. For this particular frosting, I flavored it with even more lemon. Of course, if you want to keep the lemon flavor a bit more in check, you can substitute vanilla extract or almond extract. I adore the big lemon flavor in this cake. And those crunchy, slightly nutty-tasting poppy seeds are a terrific addition for flavor and texture. And then the frosting (with even more lemon!) really adds to that big, bright, happy flavor. I have to tell you that there were some trying times in getting to the result you see here. Let’s just say that I spent a good bit of time cleaning up lemon juice from my counter and floor. But I persevered for the sake of dessert, and I can now happily share this luscious lemon cake with you! Enjoy! 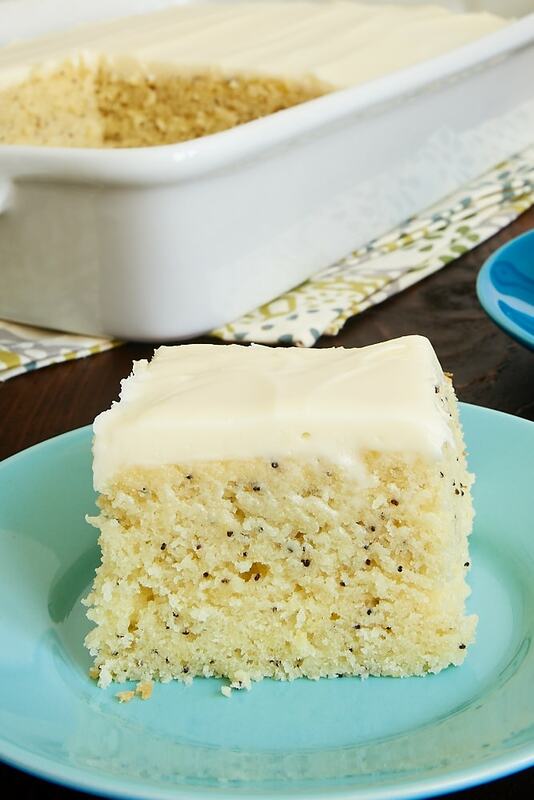 Lemon Poppy Seed Cake is a sweet, tart, moist, amazingly delicious cake. Such a bright, happy flavor! Whisk together the flour, poppy seeds, baking powder, lemon zest, and salt. Set aside. Transfer the batter to the prepared pan and spread evenly. Bake 35 to 40 minutes, or until a pick inserted into the center comes out clean. Cool completely in the pan. Using an electric mixer on medium speed, beat the cream cheese, butter, and lemon juice until thoroughly combined and smooth. Gradually add the confectioners’ sugar, mixing well. Spread the frosting over the top of the cooled cake. If you want a bit less lemon, reserve 2 to 3 teaspoons of lemon juice from the lemons from the cake to use in the frosting. Or substitute 1 teaspoon vanilla or almond extract for the lemon juice in the frosting. Just pulled this cake out of the oven and my house smells so lemony! I added a bit of Limoncello, of course. 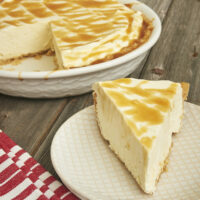 Will frost later and serve as main dessert at a dinner party tonight. I can’t wait to try this! Frosted and very much enjoyed last night by my dinner guests! Super moist and nice and lemony. Thanks again! I too am obsessed with lemon poppy seed cake but rarely think of it when it comes to baking something with lemon! 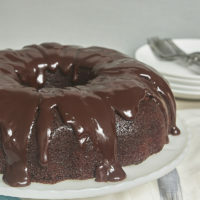 Love this cake, I’ve only ever made pound cake. Oh wow. I am a lemon lover, for sure, and this cake looks fabulous. Like I’d probably eat half of it myself kind of fabulous. Yikes. I’m pinning this and (hopefully) sharing it with friends! Lemon poppy seed muffins are my favorite, so I”m pretty sure I’d also love this cake! 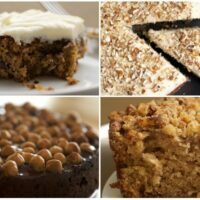 For all your recipes, if I half the amount how should I adjust the baking temperature and time? Hi, Kate. It really depends on the recipe and what type of pan you’re using. Usually you won’t need to adjust the temperature, but the time will need to be reduced. 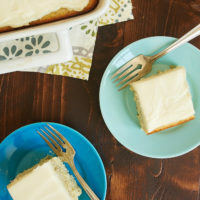 This cake recipe, for instance, could be halved and made in an 8-inch square pan, but I probably would only reduce the baking time by a few minutes (if at all) because the thickness of the batter doesn’t change that much. 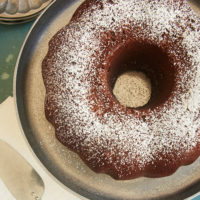 Since this is a 3 cup flour recipe have you ever used a bundt pan ?